Arancini di riso are one of the best street food to have in Italy: delicious golden balls of fried rice with a filling always different. This dish is really popular throughout Sicily but nowadays you can find them in every single rosticceria along Italy! We want to present today a variation, called arancini di riso with ricotta, coming from Trapani, a fab town in Sicily. 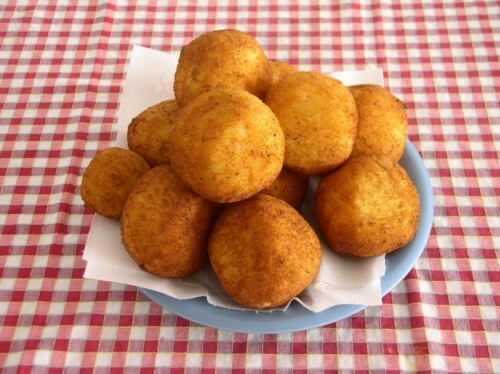 To make 4 servings arancini di riso filled with ricotta for 4 persons, here we go with the recipe! . Clean the spinach, after having washed it well, and blanch it quickly in the water; when it is well done remove it from the fire, and as soon as the spinach has cooled down, squeeze out most of the watery part and chop it in really small pieces. Mix it with the ricotta and a handful of the cheese (Parmisan or Caciocavallo). Boil the rice until it reaches the “al dente” stage in abundant salted water. Drain it and put it into a bowl. Season it with the rest of your cheese, two eggs lightly beaten, and the saffron (if you like it). Mix everything well and let the mixture cool down. Take a full tablespoon of rice and flatten it out against the palm of your hand. Cup your palm to make a hollow and fill it with a spoon full of the ricotta mixture. Cover the filling with a bit more rice, shaping the ball into a ball shape. Roll the arancino in flour and do it again, until all the rice is used up. Beat the remaining eggs, seasoning them with a pinch of salt, and put the the arancini in them. Then, roll them in breadcrumbs and fry them until golden. Drain them well and serve them. They are delicious both hot and warm. This entry was posted on Thursday, November 1st, 2012 at 4:38 pm	and is filed under Italian Recipes and Food. You can follow any responses to this entry through the RSS 2.0 feed. You can leave a response, or trackback from your own site.